So there’s this SHINE-Y girl, named Ashley. I discovered her a few months ago on my blogging quest, and she has quickly become a daily read. Ashley is always thinking of ways to spread her shine and her latest venture is just AMAZING! It’s the Pass It Forward movement. Ever since I “met” Ashley I have been more concision to pass it forward. I have looked for opportunities in the smallest of places, to make someone else’s days just a little brighter. This week I passed it forward. We made our first Easter donation to the local rescue mission and inside of the envelope along with our donation was a place mat. 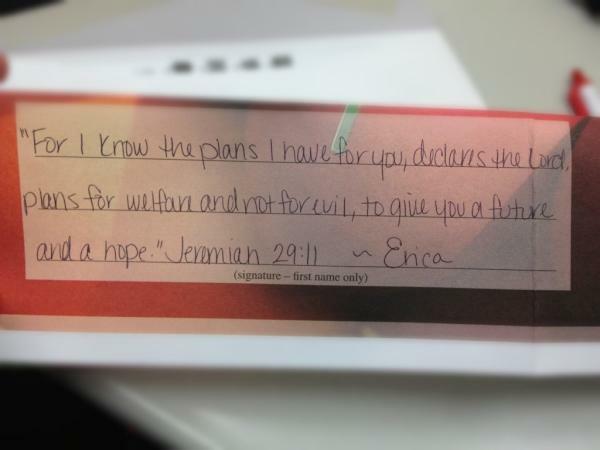 You could simply sign your name, or write a little word of encouragement on this place mat. I can only hope that those few words, and one small bible verse would give someone encouragement. Perhaps it’s a fellow mom like myself…or a son, a daughter, brother, sister, husband, wife, aunt, or uncle. The point is we all go through struggles. We have all come upon hard times-some harder than others. Thankfully there are places like our rescue mission to help those in our area who have come upon these hard times. Everyone we meet is fighting a battle. Perhaps they wear their battle scars on their sleeve, but most don’t. If I can make a difference in the life of one person, or put a smile on one person’s face where there wasn’t a smile before-then I have succeeded. I can only hope that the person who receives my place mat will take those words of encouragement and pass.it.forward to someone else. All it takes is one person to make a difference. this was a great way to pass it forward. i have a few cards, burning holes in my pockets right now…been trying to figure out a good way to get my kids involved with it too!